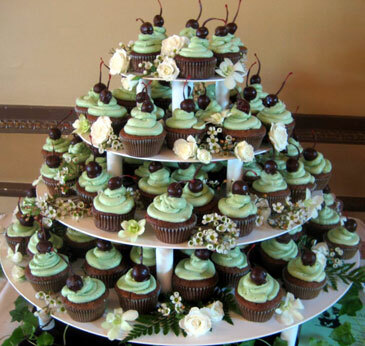 "Why are cupcakes becoming so popular at weddings? Maybe because they're sweet, beautiful, and delicate... a lot like love!" (also cheap, easy, possibly DIY and neatly portioned into individual servings already!).. 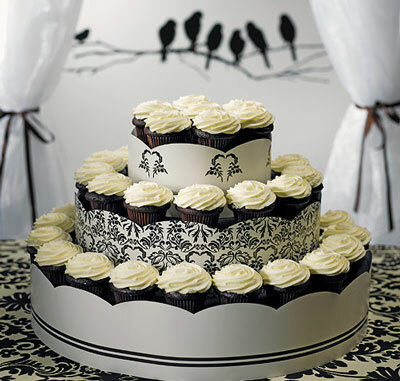 If you've been to a wedding in the last year, chances are good that cupcakes were served in lieu of - or in addition to - a wedding cake. Wedding cake makers have had to update their menus and websites to meet the growing demand for wedding cupcakes, which are poised to overtake wedding cakes in popularity. 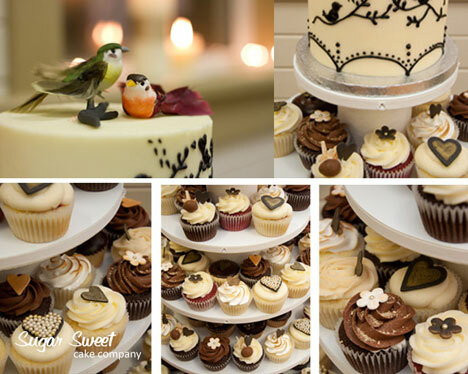 With cupcakes becoming the new norm at weddings, cake makers will need to get increasingly creative to stand out! When you think about it, cupcakes have quite a bit going for them! Here are only a few (most of which we found on the vancouver wedding blog). Can be easily personalized. In theory, each guest could have their own personal cupcake. For a smaller affair, it can be easily done and would add a great personal touch to your event. Are also very economical. You can keep costs down by just adorning them with pretty icing. The actual baking costs of the cupcakes are far less than an actual wedding cake. And.. They are the ultimate DIY wedding cake. You may not trust someone in the family to make a "proper" cake, but any friend can spend an afternoon baking a bunch of cupcakes! You don't have to cut them in order to serve them. So you require less staff at your reception (more savings!). 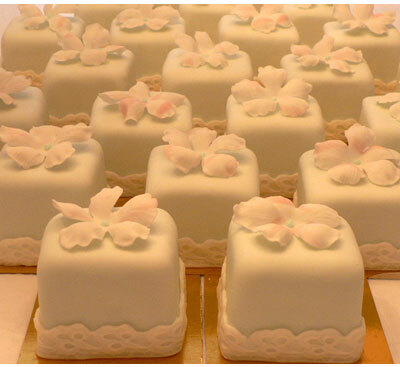 You can simply have them laid out for guests to take directly from the cake table. They can double as centrepieces! Wow! 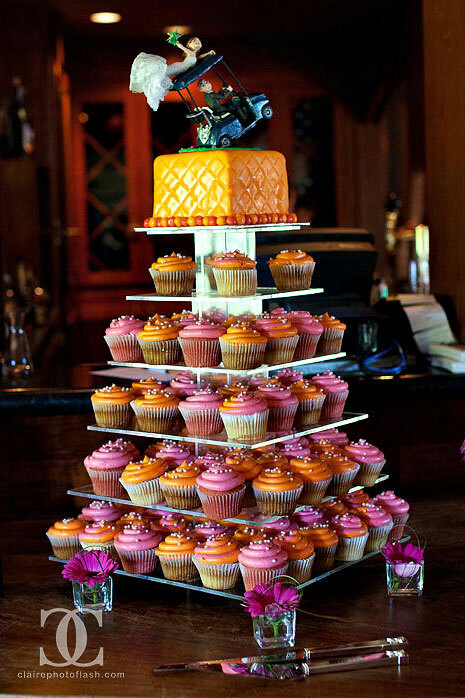 Arrange your cupcakes in the centre of each table as the centrepiece. Save a centrepiece and be different and original again! They are so pretty!!!! I don't know about you but I just love looking at cupcakes with all that decadent icing on them. And you can easily do different colours, match them to your theme, adorn them with initials, patterns etc.. They are really trendy. Simple to make, easy on your budget, and full of sugary goodness AND all the rage. What more can you ask? Personalization is the icing on the cupcake! 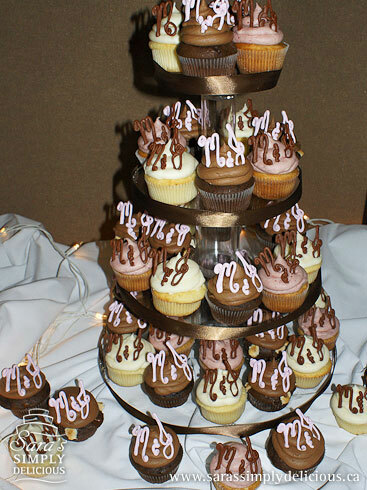 These decadent treats by Sara's Simply Delicious in Sydney, Nova Scotia are topped off with the bride and groom's initials. Cupcakes can be classy? Of course! 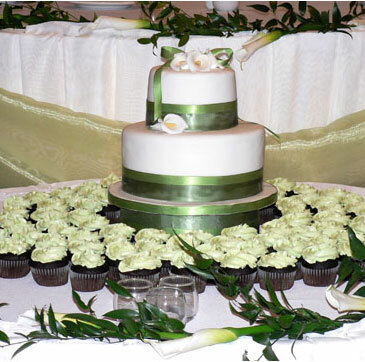 These chocolate cupcakes are frosted with a sweet, spring green icing and topped with a calla lily cake, courtesy of Patricia's Cake Creations in Mississauga. 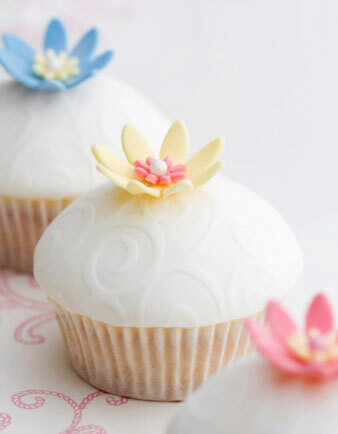 Vanilla cupcakes are topped with embossed fondant over a rich layer of real Buttercream icing. 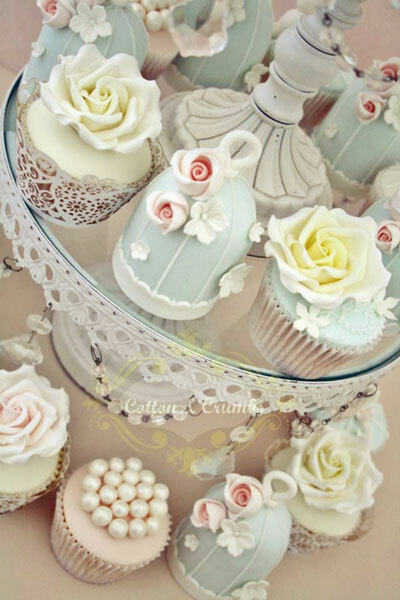 A tiny whimsical flower with pearl candy center completes the decoration on these sophisticated cupcakes. Just when you thought they couldn't get any sweeter, here we have cupcakes with a chocolate-dipped cherry on top! 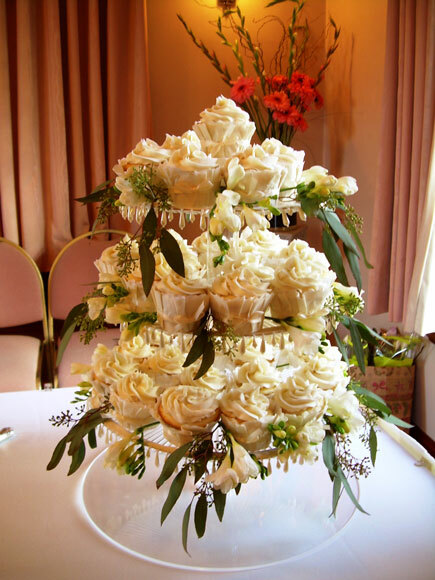 Created by Victoria, BC's Cakes Galore, this tiered tower of wedding cupcakes demonstrates how beautiful the overall presentation can be with a few perfectly-placed blossoms. Makers of the best cupcakes in Montréal, Sugar Rush Cakes has created this tower of classic vanilla and chocolate cupcakes topped with icing and sprinkles. 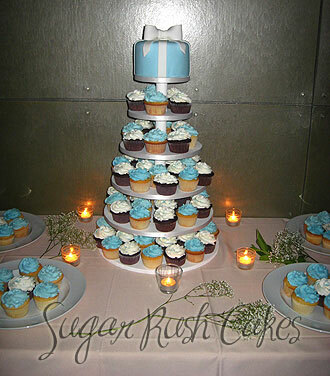 The cake "present" on top is frosted with beautiful baby blue icing and white icing bow, to complete the perfect package. More wedding cake ideas? 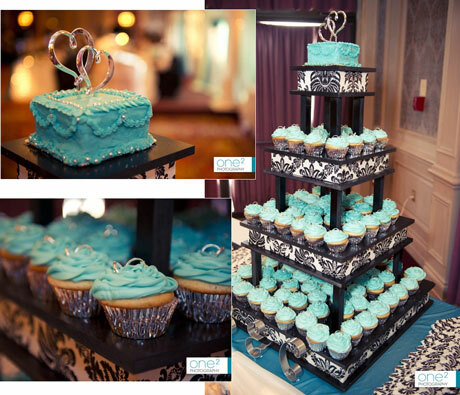 Some wedding cake articles for you. Google Images has a million photos to browse: search cupcake wedding cakes or something..
From Courtney & Brad's wedding: that's the way to do it! Ad a mini "cutting cake" to the top of the cupcake stand/tower. So you can still have a "poper" traditional cake-cutting during the wedding reception (another photo-op!) 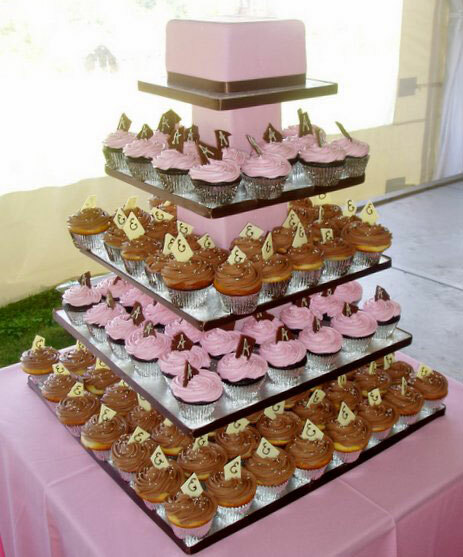 but then simply serve or buffet the yuppy cupcakes to each guest.. Some great real-life examples to help you. Click for bigger photos. 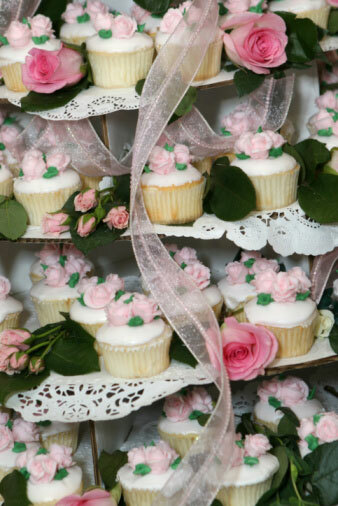 Adding fresh roses and greenery, along with ribbon and lace-edge doilies can really bring a cupcake tower to life! These vanilla cupcakes are topped with rolled buttercream and tiny fondant roses carefully tinted to match the bride's choice of colours. Did you know in medieval times that roses petals were all the rage not just for their looks but for their flavour and healing properties? Rose petals were used in many dishes for the wealthy and rose water was used for luxurious bathing by nobles. Physicians prescribed rose water for medicinal purposes including healthy heart, certain organs and to prevent/cure fainting! 10 different flavours of cupcakes, including Cocoa-nut!